From her first day at Westwind Cremation & Burial, twenty-three-year-old Caitlin Doughty threw herself into her curious new profession. Coming face-to-face with the very thing we go to great lengths to avoid thinking about she started to wonder about the lives of those she cremated and the mourning families they left behind, and found herself confounded by people’s erratic reactions to death. Exploring our death rituals - and those of other cultures - she pleads the case for healthier attitudes around death and dying. Full of bizarre encounters, gallows humour and vivid characters (both living and very dead), this illuminating account makes this otherwise terrifying subject inviting and fascinating. 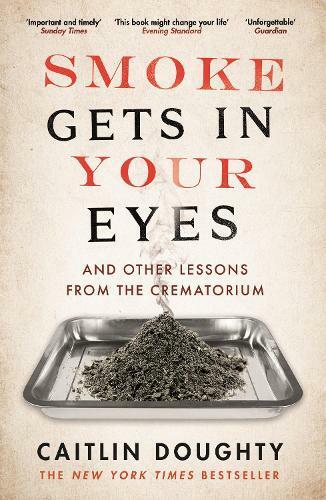 Funny, gruesome and thought-provoking, Smoke Gets In Your Eyes is Caitlin Doughty’s candid account of her early experiences working with dead bodies, first as a crematorium operator and then at mortician school. Doughty, who’s been rather aptly described as a ‘hipster mortician’ by the Huffington Post, is well known as the creator of YouTube series Ask a Mortician, and is founder of the growing death acceptance organisation The Order of the Good Death. She’s an engaging storyteller and her wry descriptions of her daily tasks are strange and unexpectedly delightful from the opening sentence: ‘A girl always remembers the first corpse she shaves’. And, later: ‘It was the beginning of a Jane Austen novel, if Mr. Darcy was a grieving son/HBO enthusiast from Perth and Elizabeth an entry-level cremationist.’ You should pick up this book if only to read lines like this one. Corpses aside, Smoke Gets In Your Eyes is packaged as a fairly straight-forward coming-of-age story. The essays are linear and throughout Doughty writes endearingly about the anxieties that often plague the early twenties. She frets about earning the respect of her co-workers, worries about The Future and falls in love with a boy living across the country. Yet, Doughty also casually slips other little titbits alongside her personal anecdotes, everything from witch burnings to mortuary cannibalism, and reflects on them. Time and time again, she reminds the reader that Western attitudes towards death are not the only option, that things have not always been this way. She implores the reader to ask why we think about death the way we do, to question what the accepted stories about death mean as opposed to blindly accepting them. At heart, her ‘memoir’ is really a passionate argument for reconsidering our relationship with the dead and it is an argument that convinced me. Smoke Gets In Your Eyes will change the way you think about death, and for the better. Bronte Coates is the digital content coordinator for Readings. She is a co-founder of literary project, Stilts.